Carpenter Local 551 is the union claiming jurisdiction for display erection and dismantling in Houston. Employees of exhibiting companies, however, may set their own exhibits without the assistance of the union. Any labor services required beyond that which your REGULAR FULL-TIME employees can handle must be rendered by Carpenters Local 551 (as hired by the general contractor or an independent contractor, such Absolute I&D. 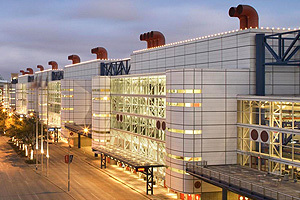 The George R Brown Convention Center in Houston, Texas, has contracted with 21st Century Expo Group to be the exclusive provider of all DOCK area services. Materials/product/equipment handling to and from the dock are and the exhibit space. Operation of all forklifts, cranes, forklifts, dollies, hand trucks, carts, and other equipment for moving, positioning, uncrating, recrating, skidding, unskidding, etc. of product, displays or equipment. If you would like to receive a free quote for you trade show exhibit installation and dismantle in Houston, please call us at 1-866-685-8950 or complete the form below to have someone reach out to you.